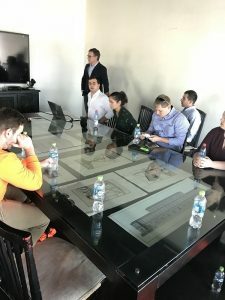 Today, we started off our day with a short Chilean metro ride to The Territoria Group, which is a real estate development firm based in Chile but operating in the whole region of South America. Territoria’s unique vision, which is to connect people to the places they are in, has helped it become one of the leading and most innovative designers in the region with projects ranging from residential to hospitality to retail. 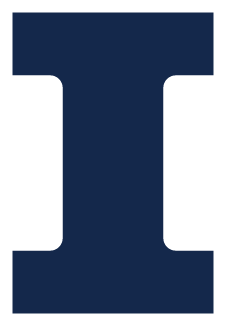 At the presentation, we were told that a lot of the employees have worked in New York City for up to thirteen years and that it’s helped them become better designers today. The office takes advantage of both open space conference tables and artistic designs around the office as you can see in the pictures below. 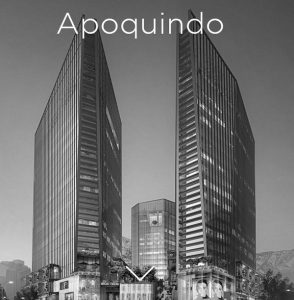 The presentation then moved on to the company’s current project, which is a mixed-use project called “Apoquindo” and designed by KPF, a New York firm that one of the partners of Territoria used to work in. Conveniently, this project is located right across the street and can be seen right out of the windows from the office. 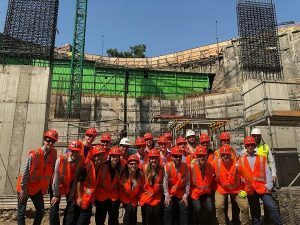 Currently, all a person can see from site is a huge pit and preliminary construction, which the Global Leaders will visit right after the presentation. 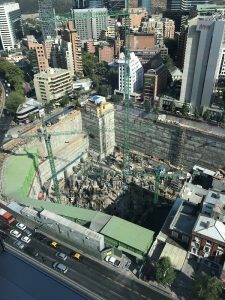 This is how the finished product will look and the two high rises with the connecting plazas in between them will be a very delightful addition to the growing Santiago skyline. The design is very dynamic as it incorporates a lot of different uses into one that sounds very efficient and convenient. 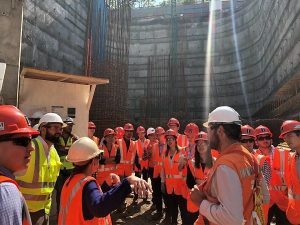 To start with, the Tobalaba Metro station will be directly connected to the project in the third underground level. The project will also add 2000 bike stations with secure parking for eco-friendly commuters. Of course, the structure will have traditional underground parking for 1,245 cars as well. 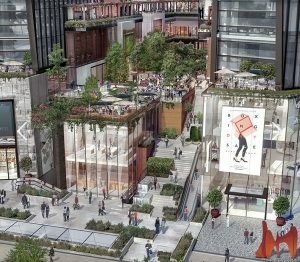 The first five floors, starting at the third underground one, will offer retail opportunities ranging from small traditional Chilean stores to large flagship stores of international brands, which are trying to get a foot in the door here in Chile as it continues becomes a more modernized and open country. On the surface, there will be some open plazas and green space to add to the artistic design. The rest of the building will be reserved for office space and includes both Class A offices and coworker studios. There is no specific or strict leasing timelines for stores or offices as Territoria will set these in their contracts based on the size of the store or firm. At the conclusion of the presentation, we were escorted downstairs and taken to the actual construction pit, which is the deepest we’ve seen on this trip and one of the biggest. 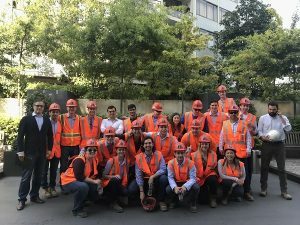 We got to climb down the construction ladders all the way to the first floor of the building where it connects with the metro and it was interesting to see how they are connecting and integrating this site with the greater transportation sector which is expanding at a high rate as we’ve learned from our stay here in Santiago, Chile.